That Peck's Bad Boy of the Travel Channel, Anthony Bourdain, recently commented in the New York Times that San Francisco is "a two-fisted drinking town, a carnivorous meat-eating town, it’s dirty and nasty and wonderful…" and Femme de Joie would pretty much agree on all counts. Never having lost her love of that deliciously wicked town and all its delights, she particularly craves the myriad restaurants of Baghdad-by-the-Bay and greedily anticipates the next eating adventure there. Not long ago, M. de Joie and Amico del Signore decided to tread in a couple of Bourdain's footsteps to the House of Prime Rib, a bastion of unapologetic worship of beef and booze on Van Ness. A reservation was made by phone for a Saturday night at 9 p.m., and the House of Prime Rib returned a confirmation call two days before. It was a lovely night in The City. M. de Joie and A. del Signore arrived on foot at the House of Prime Rib, bypassing the valet parking available. We were about 45 minutes early and said as much to the reservations clerk, who checked us in and directed us (naturally) to the lounge. House of Prime Rib hasn't changed their decor since its inception: part faux-English Squire's manor, part private men's club, the enormous space is divided into manageable rooms with dim lighting and classic retro furnishings. We found a small table near the fireplace; the cocktail waitress arrived within three minutes. 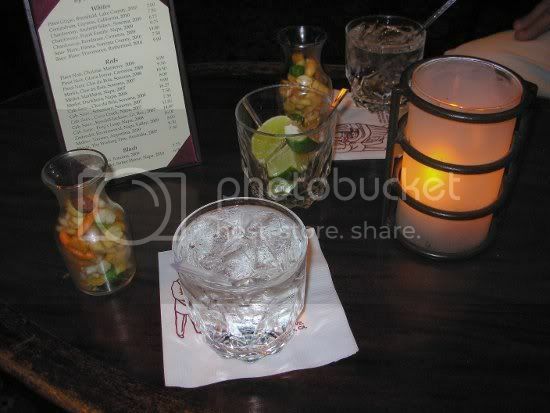 She was friendly but efficient and took our orders for two Bombay gin and tonics, extra lime ($8 each - a surprise bargain in pricey San Francisco considering we called the liquor). Cute mini-carafes of generic bar snacks came with our cocktails. The g-and-t's were perfect, with lots of extra lime wedges on the side. As we waited in the lounge, we took note of the mix of clientele: an older couple seated in brocade armchairs who never looked at or spoke to each other; a large party from Italy who were meeting an American relative; frat boys boisterously boozing; two middle-aged men of eccentric but expensive means, negotiating a business deal; a younger couple on a date which he appeared to be ill-prepared to pay for. After draining our drinks, we waited for our reservation to be called. It was Saturday night, after all, and quite busy even at 9 pm. Femme de Joie ordered another gin - what the hell, she wasn't driving - and the minutes ticked by. The crowd thinned. No one looked our way. At 9:40, after sending up a couple of flares, Amico del Signore got the attention of the house manager and pointed out that we had a table booked for 9 p.m. and it was now leaning toward 10 pm. There was a flurry of activity: they were so sorry, it was an oversight, please just one moment, and then we were whisked into a dining room and seated at a rather small table. M. de Joie sat on the banquette, which wasn't bad, but A. del Signore was perched on a wooden chair that stuck out into the walkway the waiters used. This was not going to work. We flagged down a busboy and asked if we could have a nearby table that was more accommodating. And then... we finally got waited on. The restaurant manager escorted us to a much nicer table where we could both sit at the banquette, overseeing the room. We were assigned an experienced waitress (making us wonder just who we might have gotten had we remained at the Tiny Table), and the manager handed us a menu of wines-by-the-glass, apologizing again for their oversight, inviting us to order any glass of wine on the house. It seemed churlish to go directly to the $16 Duckhorn or Frog's Leap, so we both ordered the 2007 Clos de Bois Merlot for $8, which was undistinguished. Note: if this should happen to you, don't be modest. Go for the expensive wine. The House of Prime Rib serves two things: prime rib and fish. Nearby was a table full of Japanese tourists who had all ordered the fish (making us wonder why they'd bother visiting this restaurant when there are so many fine fish restaurants in SF); each one had a large plate with a perfect but lonely salmon fillet in the center. We went for the prime rib: one Henry VIII cut and one English cut. 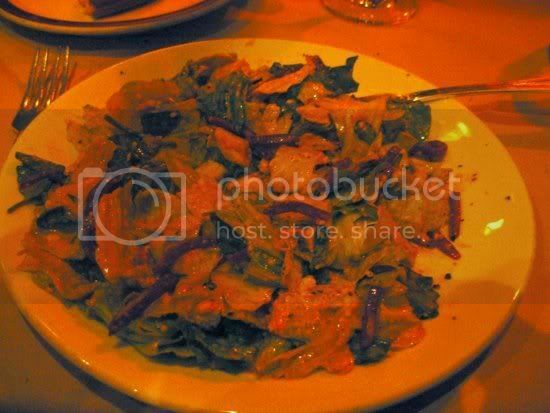 First came the salad, which is apparently famous for the dressing that takes three weeks to make, and which, we were assured, some people come to the restaurant specifically for. It was quite a production, the Making Of The Salad, whomping the salad bowl to make it spin on a bed of ice, pouring the dressing from on high to anoint the salad greens and beets like holy oil, finally presenting the spun-poured-anointed plates of salad with a chilled fork with which to transfer lettuce from the plate into one's mouth. Femme de Joie would like to say here that the Presentation Of The Chilled Fork is a ritual she finds exceedingly pretentious, if not downright silly, but it seems to be catnip to a certain genre of diners. Well, it's a salad, isn't it? Despite the glam production, it tasted very much like a salad covered in bottled Seven Seas Russian dressing. That's not to say it was bad; it wasn't. But neither was it all that fabulous, either. It was lettuce and canned beets covered in a sweet red sauce. Hardly had we finished our lettuce parfaits when the plates were whisked away and a triangular apparatus was set before us, containing three strengths of horseradish. We'd barely had time to slice some sourdough bread before our plates of prime rib were plopped in front of us. They looked about the same except that Amico del Signore's more expensive Henry VIII cut contained the rib bone, which the waitress told us was good luck or a propitious augury or something like that. It may be, but it also is inedible and when you're paying by the weight for prime rib, it's a bit of a rip-off as well. Standard accompaniments are mashed potatoes and gravy (which were both good, albeit salty), Yorkshire pudding (used here to absorb the gravy, rendering it pretty soggy), creamed spinach (which is one of Femme de Joie's very favorite foods but here was on the dry side and salty), and creamed corn (the best of all the sides, nicely sweet and creamy with a little crunch to the kernels). The prime rib itself was perfect: cooked as requested and meltingly tender with the mineral taste of aged meat. The horseradish was exactly as described: "mild, medium, and watch out," and we both piled on the Watch Out. We cleaned our plates. We had understood that when the larger cuts are ordered, that free seconds are offered, but this did not happen. Here's your hat, what's your hurry? The plates were removed, the horseradish tree disappeared along with the barely-touched sourdough loaf before we realized what had happened, and suddenly dessert menus were proffered. All the desserts were old-school: peach Melba, bread pudding, strawberry shortcake - classics all, but we'd barely had time to consider the dinner we'd just had, never mind sweets. We skipped dessert. It was barely a minute later that our bill arrived: $119. We were aware of the prices when the reservation was made so it wasn't a shocking total, but when we considered all that had transpired, the disappointing quality of some of the dishes, and the rush to get us served and out the door, it seemed very high. By 10:30 p.m. we were outside on Van Ness again, slightly dazed and wondering if things would have been different had Anthony Bourdain been with us. House of Prime Rib, 1906 Van Ness Avenue (between Washington and Jackson), San Francisco, California. 415-885-4605. Valet parking available, but MUNI lines 1, 10, 12, 17, 19, 47, 49, and 76 all run within a few blocks. Full bar. Open for dinner nightly. Reservations essential; call restaurant or book at OpenTable.com. Vegetarians and vegans: nothing to see here. Website at houseofprimerib.net. Priced by weight? By that do you mean that they cut the rib and weigh it before delivery? I would be appalled and litigious if that were to happen. Back in the day (almost forty years ago, good heavens) I worked at the Hungry Woodsman in Medford, before that corner where it was situated was turned into a confusing bit of a historical trash-bin by the "street improvements". The Woodsman was modeled on a number of steak places in SF, but I'm not sure if any still survive except Mortons. It was built (my stepfather was one of the builders, my mom worked at the "general store" next door which was owned by the same man, as bookkeeper/accountant) using timbers cut from either Pier 17 or 21, whichever was the one they tore down in the 1972 timeframe. I was a dishwasher at first, then they added prep cook and whatever name they give the guy who makes up the stuff the waiters are normally expected to do. I mixed all the dressings, rubs, seasonings, cleaned the walk-in where the salads were kept, and ran the dishwasher, oh yeah and chipped open all the crab legs and made salads and strawberry shortcakes and so on and so on. I did NOT cut the beef, but I put the seasonings on and often loaded the roasts when I worked the lunch shift. So, the prime rib has ribs 6-12 and maybe a few more. The other parts were cut into rib steaks, or rib-eye steaks. They went through at least 2 sides of beef a night, at least 5 on a weekend night. Preparing prime rib was thus: untie the roast, which is loosely tied. The butcher already separated the bone from the muscle, usually leaving only a small bit connected. Splash it with the soy/kitchen-smoke mix, then rub it over with the dry rub, a mix of granulated garlic, granulated onion, paprika, mustard, season salt (redundant right?) and ground black pepper. A small amount of this went between bone and muscle. Then they tied it back together - I was usually assembly-lining this and the chef actually tied it because I hadn't mastered the Butcher's Knot. We did not "age" our beef. Bob (the owner) tried to do that but couldn't get it to come out right, and the inspector gave him the hairy eyeball IIRC. Him or the manager guy - who looked like KC from the Sunshine Band. Anyway, the rib itself usually wasn't served to customers with the prime rib. It was removed and separately sold to the lunchtime crowd as Beef Ribs. And if they didn't sell, the evening crew (which got fed before time) would have to eat 'em -- torture, right? So back to the present. The bones will probably be prepared the same way because it allows them to get more out of the same cuts. But when the rack is not removed, depending on where your serving is cut, you may or may not be able to get a bone. Most places will recommend you buy a rib steak if the bone is necessary to you. Further, the bones having been present in the roasting have already imparted their flavor, so there is no loss in not having them, unless you are particularly in touch with your inner carnivore. 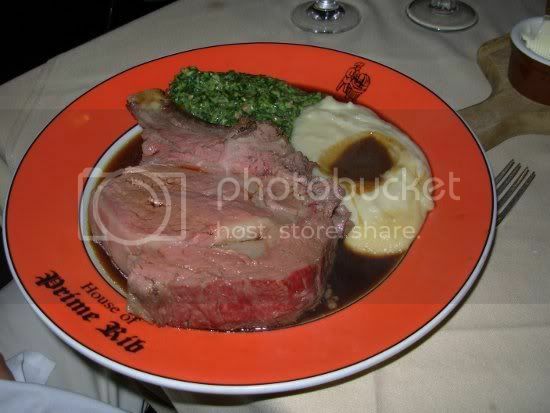 Thus when cutting a serving of prime rib from a roast which has not been pre-boned, the chef at the fancy inflated-price place should consider both the overall diameter of the rib and the thickness of the cut in order to deliver an approximately equivalent amount of meat, to match what the menu promises will be delivered. The bone should be ignored in the calculation. 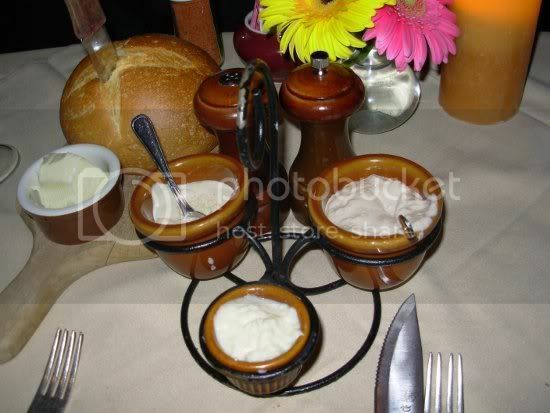 You will hopefully be able to observe that by comparing different plates served over the course of an evening - since the cow is not courteous enough to grow the muscle to a uniform thickness over its cross-width, the chef adapts to the taper by cutting the smaller diameter pieces thicker. The only time a kitchen scale should come into this is when the chef takes the first cut off the roast, when they are first learning how to get the sizes right, or when the master chef is checking their accuracy. Any restaurant which does otherwise is mendaciously crooked and should be mocked, yelped down, and reported to the food inspectors, as some places have made that illegal, and they deserve the hassle in any case if they do. Weight was probably an inaccurate way to describe it, but it was supposedly a much larger serving than the next smallest. But if there's a rib bone in there, that takes up a considerable amount of room. The Henry VIII cut was $41.85; the English cut was $38.85. We paid three dollars for a bone. After thinking about this, weight is usually how restaurants price/sell prime rib, and often other steaks as well. They're usually listed something like 8-ounce cut, 12-ounce cut, 16-ounce cut. Steaks are usually 10-ounce and 16-ounce. So yes, weight is how they sell it, but whether they actually weigh it before plating to ensure the customer gets what they're paying for is very doubtful. Hence why I described what I knew to be the practice at the one place that I worked that specialized in steak. I can tell you that the accuracy depended in some part on the cook; I saw one the chef (the guy who cut the meat) backhand to the head the younger guy cook* when he wasn't paying attention and was under-cutting the servings. I also know that including the bone in the weight would have caused the owner to fire the person who prepared the plate that way, and possibly to fire ON that person. And I'm sure there are restaurants which should know better. Some of the places described in Kitchen Confidential made me reconsider wanting to ever eat in a restaurant in NYC. (*) Incidentally that younger guy was fired and his last check withheld, when the new manager with the K.C. mustache found the source of a discrepancy in the books Mom had found and pointed out (plates served vs. amount of meat purchased was somewhat off. She had worked at my Grandma's restaurant and knew to look for those costs, even if she seemed to be "just a woman who does the books") - it seems Younger Cook had been taking home one or two sirloin tip roasts a week (about $120 in 1975 with the costs at the time) ... and feeding them to his dogs. I know he had threatened to sue for withheld wages, and that he was arrested shortly after that and they found the meat in his freezer - he really WAS that arrogant.